You don’t have to keep hiding your smile if your teeth are badly worn or chipped, if there are lots of spaces between them or if they are poorly shaped. Porcelain veneers can dramatically change the look of your teeth. And in New Orleans, Dr. Duane Delaune of Metairie is an accreditation candidate of the American Academy of Cosmetic Dentistry. He is able to give you a beautiful smile makeover with porcelain veneers in as few as two appointments. That’s a clear advantage over waiting years for braces to straighten your teeth. Porcelain veneers are custom-made shells of porcelain. The veneers are tooth-colored, so they look natural. And they are more durable than your natural teeth, even though they are about as thin as a fingernail. They are made in a lab by our ceramist, based on information provided by Dr. Delaune. 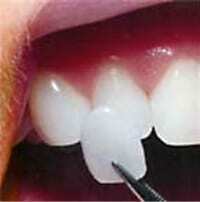 The veneers are bonded to the front of your teeth. Porcelain veneers are very thin and durable. You’ll receive an examination and x-rays, and you’ll make a decision about a smile design. What color do you want your for your teeth? What shape and length? Do you want a smile that is sophisticated or bold? Is there a certain look that you don’t want for your new smile? Dr. Delaune will carefully listen to your input, give you his professional opinion, and use all of the information to arrive at a smile design that is custom made for you. You’ll see digital images of the proposed smile, which you’ll likely love right away. But if you don’t, adjustments will made made until you love what you see. Based on the digital images, a wax-up of your smile makeover will be made. Either you absolutely love it, or it will be adjusted until you do. In some cases, it may be determined that if the veneers are placed directly on the teeth with no preparation, they will look bulky. If that’s true in your case, your teeth will be very lightly shaved to ensure that the veneers will look and function like your natural teeth. From the wax-up, provisional veneers will be made. Once you’re completely delighted with the provisional veneers, impressions of them will be sent to our ceramist to make your porcelain veneers. When your porcelain veneers are ready, you’ll try them on with a try-in paste. If you absolutely love your smile makeover without reservation, the veneers will be bonded on your teeth. If you’re at all hesitant about the smile makeover, the veneers will be sent back to the ceramist for adjustments, or if necessary, to make a completely new set of veneers. How Do Porcelain Veneers Compare to Natural Teeth? They look and feel like your natural teeth. Unlike your natural teeth, they resist coffee, tea, alcohol and tobacco stains. Veneers need excellent at-home care. As with natural teeth, you need to see your dentist for professional maintenance. Dr. Delaune’s experience is that usually, in the beginning stages–when our patients see the wax-up—they love their new smile right away. But, Dr. Delaune has a beautiful smile guarantee, so be assured that before your veneers are permanently placed, you’ll absolutely love your smile.